Hey, dog people! Guess what Miuccia Prada showed at Miu Miu in Paris today? Cats. Hundreds of little cats crawling all over breasts and butts and legs and stomachs and arms and thighs. 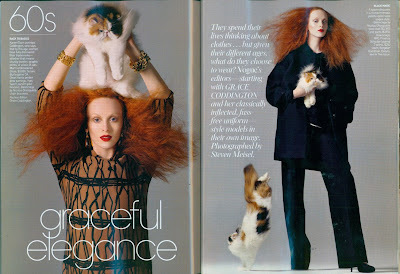 Yes, at last, cats have leaped from the pages of Vogue to the runway, where they belong. In fact, buyers went gaga over dresses bearing embroidered cats last week at the Azzaro presentation (those were modeled after designer Vanessa Seward’s cat Monsieur Jo). The other dominant prints in the Miu Miu show featured swallows and a naked, writhing woman. But those pale next to the cats. Puppies may be cute, but runway material, they are not. See a complete slideshow of the spring 2010 Miu Miu collection.